In the past two weeks I've given two public talks about Dr. J. Allen Hynek and my book The Close Encounters Man, and the contrasts between the two talks are kind of funny to consider. 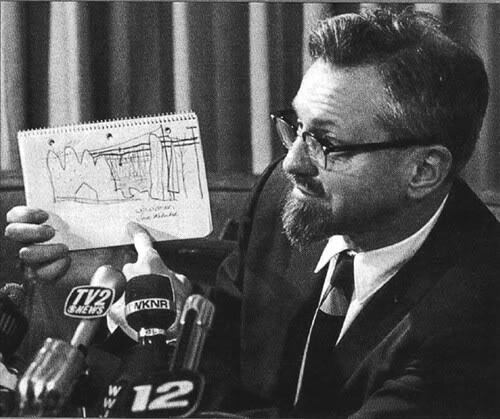 Does anyone really know everything about Dr. J. Allen Hynek? The second talk was at the Third Annual Milwaukee Paranormal Conference yesterday, and the contrast between this and the first talk was pronounced. This is my third time addressing the Milwaukee Paracon (last year was the great Roswell debate with Don Schmitt), and it was quite different from the first two years. Yesterday's presentation took place in a small conference room at the Shorewood, WI, village library, where I followed up on presentations by UFO writer and radio host Nick Roestler and MUFON Chicago's Sam Maranto. One guy really, really wanted me to declare that Disclosure is about to take place. He brought it up more than once, and each time I had to disappoint him. That didn't happen with the teachers. A couple people felt compelled to let me know that they know things about Hynek and about various UFO incidents that I don't. That's par for the course with a UFO crowd, but one guy -- the one with the notes and the tape recorder -- helpfully pointed out to me that, "Oh, Dr. Hynek's wife's name was Miriam, not Mimi." Yes, I refer to her as "Mimi" in the book, but I pointed out to him that "Mimi" is the diminutive of "Miriam," and so people sometimes called her Mimi. That didn't happen with the teachers, who are known for correcting people. -- but there's something weird about knowing that you're disappointing a lot people in your audience because you're not validating their beliefs that I am still not used to. But I guess I'd better get used to it. What many of the UFO know-it-alls REALLY want is not necessarily a validation of their beliefs...but to be the ones at the dais giving the talk and getting the attention. But...gee whiz...they just never got around to...or found the time... to do the research and write that book. The next best thing is to dominate the discussion after someone else's presentation. I know, that's awfully cynical. But I've witnessed the phenomenon numerous times. It's unfair to the presenter and annoying to the rest of the audience. It's hard not to be cynical sometimes, isn't it? I just can't let it get the better of me. You take the good with the bad when addressing groups of people who have an interest in all things strange. I love how some people run around demanding disclosure, IF, (big IF) it were to happen I imagine that it would not be because some UFO freak found the goods. They have everything to lose and zero to gain from it and the more I learn about my fellow citizens the more convinced that they probably can't handle it. People lose their minds over the latest Batman movie, just think what some of them would do if they knew about strange creatures from somewhere else. I can just see a drunk redneck shooting his neighbor coming home from a costume party. Would like to hear one of your talks. Thanks, Anon, I'll be speaking at the Wisconsin Book Festival next Saturday, Nov. 4, then I'll be doing a BBC radio interview a few weeks later. I'll post that info when we get closer to the date.